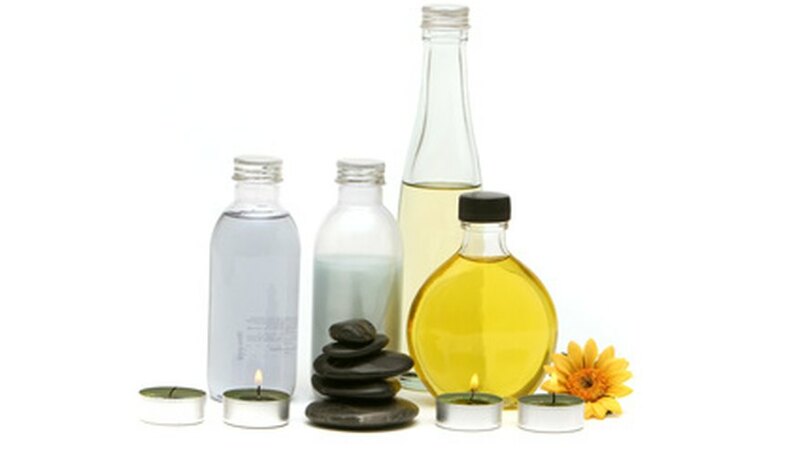 Essential oils can be found in the flowers, leaves and bark, depending on the plant, or in the rinds of fruit such as citrus. Their uses range from aromatherapy and skin care to scenting laundry and making perfumes. Using a technique called enfleurage, you can extract the essential oils from your highly scented flowers like lavender, honeysuckle, gardenias, roses and jasmine. Melt down enough lard to cover the bottom of all 10 plates to a depth of 1/2 inch. Leave the plates to cool until the lard solidifies. Use your knife to score crisscross patterns into the surface of the lard on each plate. Cover the lard surface on five plates with flower petals, being careful to keep the petals on the lard and not sticking out onto the plate surface. Petals sticking out of the lard will spoil. Add a small amount of citrus peel, scented herbs or spice to accent the scent if you like, but use these sparingly. Place one plate of plain lard upside down over the flowers, so the petals are squeezed between two layers of lard. Tape the plates together. Set your plates aside for two days, then remove the wilted flower petals and add fresh petals. Repeat this process until the flowers have been changed eight times. During this process, the lard absorbs the flower oil. Cut the lard into small enough pieces to fit into the glass bottles. Fill each bottle half full with lard and fill it the rest of the way with rubbing alcohol. Close the bottles and make sure the lids are tight. Shake the bottles well and place them in a dark place such as a cupboard for 12 weeks. Shake the bottles every day if possible; this will keep the ingredients blended and help break down the lard. Place a funnel into an empty bottle and a piece of cheesecloth over the funnel. Pour the perfume from the lard bottles into the new bottle; the cheesecloth will filter out any remaining lard. Add 2 drops of fixative oil, such as sandalwood, per quarter-cup of perfume to act as a preservative. Test different fixative oils and flower mixtures to achieve the scent you want. Use caution when melting the lard; a grease fire can easily break out if the lard is left unattended. Dean Coleman: What Are Essential Oils?